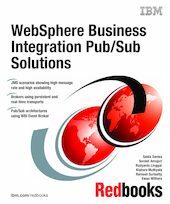 This IBM Redbooks publication provides both technical background and implementation best practise recommendations for WebSphere Business Integration Pub/Sub solutions, with emphasis on the use of JMS API. It shows the differences between tuning for performance (high message rate) and robustness (high availability), and how to balance these to provide the correct solution for a set of business requirements. The first part of this publication provides an overview of the technology behind the Pub/Sub messaging paradigm, leading to how best to use the WebSphere Business Integration product family to provide a Pub/Sub solution. The second part introduces a sample set of applications and shows how to develop the Pub/Sub infrastructure to meet different sets of business requirements. The scenarios cover configurations involving multicast, cloned brokers, persistence and stream-crossing.